Fire Up Video provides Rentable Mobile LED Jumbotron Screens of the Highest Quality. Our Jumbotrons can be used for just about any Duluth, MN event to add crowd interaction, increase experience enjoyment, track event scoring, replay event highlights, spotlight sponsors, and more. We can provide everything from the professional video staff, to the generator to power the screen, all delivered right to your event. Whether you are planning your first community get together, an annual fishing contest, a breast cancer fundraiser marathon, or just about any other sporting/community/group event, Fire Up Video has the mobile jumbotron solution to make your event more interactive and memorable. 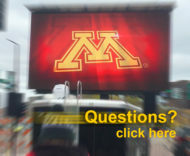 For more information or to schedule a mobile LED screen for your next event in Duluth, MN call Fire Up Video at 612-759-1012 or email us at baum3@earthlink.net.